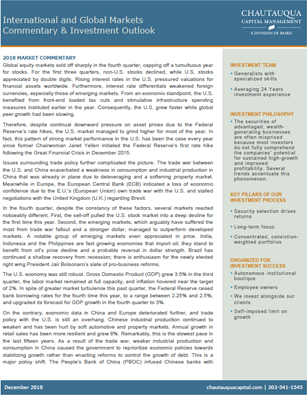 Global Market Outlook: Where do we go from here? In an acknowledgement of rising interest rates, global financial markets have de-rated. Non-U.S. markets, in particular, declined as dollar strength weakened foreign exchange rates and forced central bankers to crimp economic growth to maintain currency stability. Furthermore, growth stocks, which are justifiably priced at premium valuation multiples and whose cash flows can be long-dated, were the worst performers as rising interest rates caused multiple compression. We are closer to the end of a U.S. tightening cycle than the beginning. Should U.S. economic growth slow, international markets would look relatively more attractive. The U.S. equity market is more expensive (relative to international equity markets). For additional important information about the fees, expenses, risk and terms of investment advisory accounts at Baird, please review Baird’s Form ADV Brochure, which can be obtained from your financial advisor and should be read carefully before opening an investment advisory account. The above commentary does not provide a complete analysis of every material fact regarding any market, industry, security or portfolio. Information, opinions and other market or economic information and data provided are as of the date of the commentary, unless another date is expressly indicated, and may change without notice. The manager’s assessment of a particular industry, security or investment is intended solely to provide insight into the manager’s investment process and is not a recommendation to buy or sell any security, nor investment advice. Read our complete outlook to gain more insight.